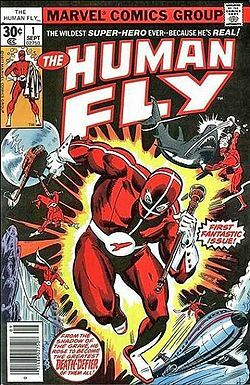 ‘The Human Fly’ To Be Made Into Film From Marvel Comics!!! ‘The Human Fly’ (sans Jeff Goldblum) will be coming to a theater near you in the near future. 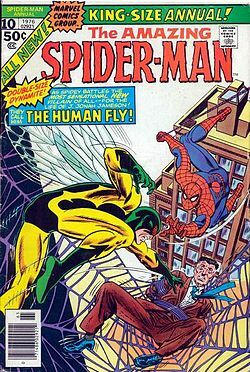 ‘The Human Fly’ is based on the Marvel Comic book series from 1977-1979 and actually based on real-life stunt man Joe Ramacieri. The comic series lasted 18 issues with some special appearances in other main stream comics. This hero film will be an indie film and will be produced by Paramount and directed by Steven Goldman. I can’t wait to see what else Marvel brings to the big screen. Alan Brewer, along with James Reach, will produce. Tony Babinski, Cirque Du Soleil’s in-house historian, wrote the Montreal-based screenplay. ‘Deadpool’ Delivers Two New Trailers for the Holidays! Enjoy the trailer for ‘X-Men: Apocalypse’! George Romero Is Coming Back To TV With ‘Empire Of The Dead’!!! Here are a couple of ‘Deadpool’ Trailers for you! This entry was posted on Wednesday, June 27th, 2012 at 12:26 pm	and is filed under Comics, Film, News. You can follow any responses to this entry through the RSS 2.0 feed. You can skip to the end and leave a response. Pinging is currently not allowed. « Bryan’s Review of ‘Ted’!!! You're Bobby Caldwell's kid. From Chicago. It's nice there, do you like it? That's wonderful. Get in the goddamn house.